Visit Rare Earth Farm for a weekend getaway and unwind in the midst of nature on a farm with animals, home-cooked food and freshly grown produce. An ideal getaway from Bangalore, you can visit Rare Earth Farm for either a day out with the family or for a weekend stay-cation with extended family, friends or colleagues. 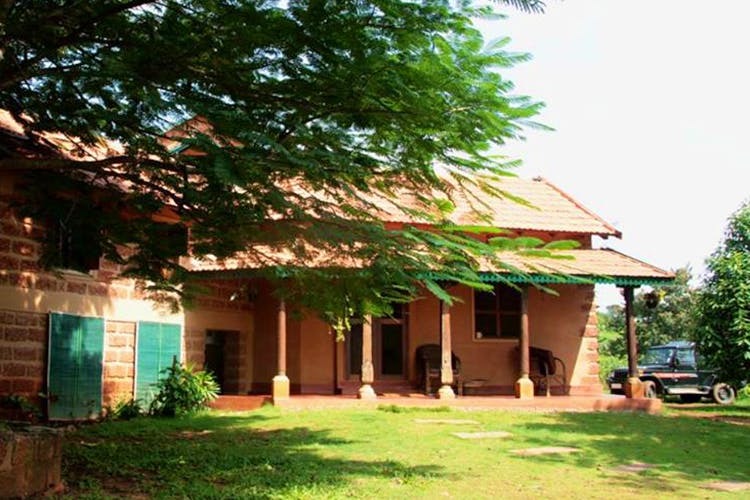 Off Kaggalipura Town, near Kanakapura, the fully live and working farm is spread across eight acres of land and has three rooms, ideal for about nine to ten adults. The going price for a night stay with all meals included is INR 4,000 for adults and INR 2,000 for children below 12. In keeping with the eco-friendly theme of the farm, you can stay in mud cottages, each different from the next. Everything in the room, from the mud walls to the aesthetic decor including the bamboo sticks and beer bottles wall pieces are all made from recycled natural farm waste. Eco-friendly for the win, yeah? Our favourite part of the cottages is that each bathroom and shower is in an open garden area and open to the big blue sky. Time to have the midnight shower you’ve always dreamed of! While one of the cottages has a living area and is two-storeyed, another cottage is like a jungle hut and is tented. Think of it as a swanky tent, which is packs in all your luxuries, including posh interiors. All meals are provided by Rare Earth Farm. Of course, it’s all freshly made with ingredients from their organic farm. Perfect to get that farm to fork experience. They also have a wood fire oven and a barbecue, and here’s a tip: do not miss out on their thin crust pizzas with cheese made from the dairy farm. There’s plenty to do while you’re there. While they have a fresh water swimming pool, a huge library with plenty of books and indoor games, we suggest you walk around and soak in the fast vanishing agricultural landscape of Bangalore. You could also participate in the farming activities or just kick back in the hammock and breathe in some of that fresh air that now seems like a myth. Kids and animal lovers will love chilling with cows, buffaloes, rescued ponies, and birds when here. Plus, a pack of cute doggos. The pooches are extremely people-friendly, so go ahead and let your kids play with them. They also have seasonal activities like fruit and crop picking, hay making and ragi and corn threshing, so make sure you book your stay around these times.